Yes, Facebook copied Snapchat. In a battle for the future of time and attention of teens and the world, the close-to-2 billion-strong social media juggernaut sought to snuff out their rival. Facebook cloned one of Snapchat’s defining features — “Stories” which launched in 2013. ‍For context, Snapchat has 166 million users, adding only 7 million in the first quarter of 2017. Facebook, or one of its subsidiaries (or all of them) could just copy and co-opt. Some pundits seem to be of the opinion that “nobody is using Facebook Stories” but we know better than to judge a move like this too early. It is fair to venture a guess that it is probably being built for the next billion users in the developing world and those yet to join Facebook, let alone Snapchat. Snap Inc, which launched the app in 2013, said in response that it wanted investors to love Snapchat for its focus on a smaller group of devoted fans who use it an average of 30 minutes a day. The zeal of those Snapchat addicts, in countries with large pools of ad dollars, is the company’s greatest asset. But Facebook’s outright imitation seems to be affecting Snapchat, halting their growth for now. Snapchat’s stock took a huge dip after adding just seven million daily active users in Quarter Three of 2016 and they have recorded a $2.2 billion loss in their first earnings report. Wall Street is not impressed, but we believe there’s still more in this game left to play. But a bigger war than Stories is playing out worldwide. As much of a novelty as Snap has unlocked so far, scaling innovative and memorable features of the camera and augmented reality, there’s still one giant they have not fully considered — pre-paid data prices. What Snapchat may take for granted is that mobile data is held constant: that it is affordable and accessible. iPhones consume more than twice as much data per minute when browsing the web than Android. Closer home, Kenyan telecommunications company Safaricom has a marketing campaign running to quell the ‘data hungry’ desires of social media services. 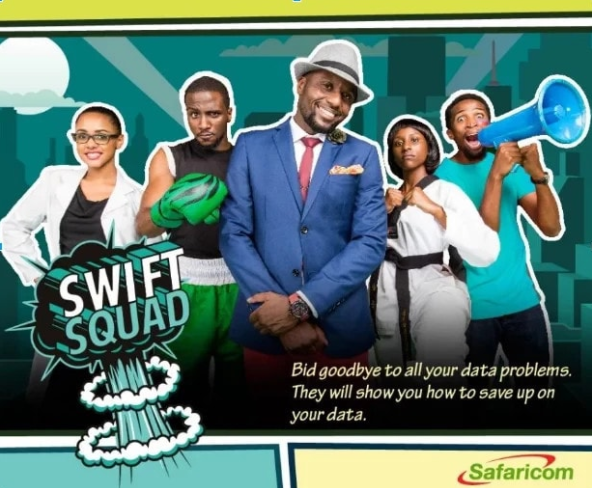 The SWIFT Squad are a group of social network-inspired avatars who give tips on how to stop pre-paid data bundles from ‘disappearing’. In a country with 97% pre-paid data subscribers, according to GSMA Intelligence, that’s not far fetched. 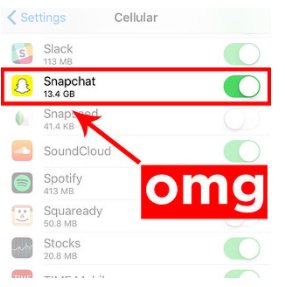 ‘Snappy Sasha’, for instance, shares the below tidbit on how to get Snapchat to rein in on the data consumption, by activating “Travel Mode”— which doesn’t exactly solve the problem but puts you in tap-by-tap control, until your exhaust your bundles. The company denied the CEO ever made the comments but the damage was already done. Indians, much like their Kenyan counterparts, launched a barrage of hashtags aimed at Snapchat such as #UninstallSnapchat and #BoycottSnapchat. Including people who went to the Google Play Store and gave it a 1-star rating to spite the company. More than 60 percent of its daily users come from the 10 countries that are responsible for 85 percent of spending on mobile advertisements. Something else to consider is it was found that India’s 200 million WhatsApp users use 50 million minutes of video calling every day, making it the top such country for WhatsApp. This speaks to an insight on WhatsApp’s part in what is certainly still a ‘data conscious’ market. Statistics such as these prove Snapchat would be wise to put some of their Research and Development dollars ($805 million as of 2016) to far more use than fancying-up what the camera can do. We do have to give them credit for their first-mover advantage scaling Snapchat and making it the camera company that they are now. 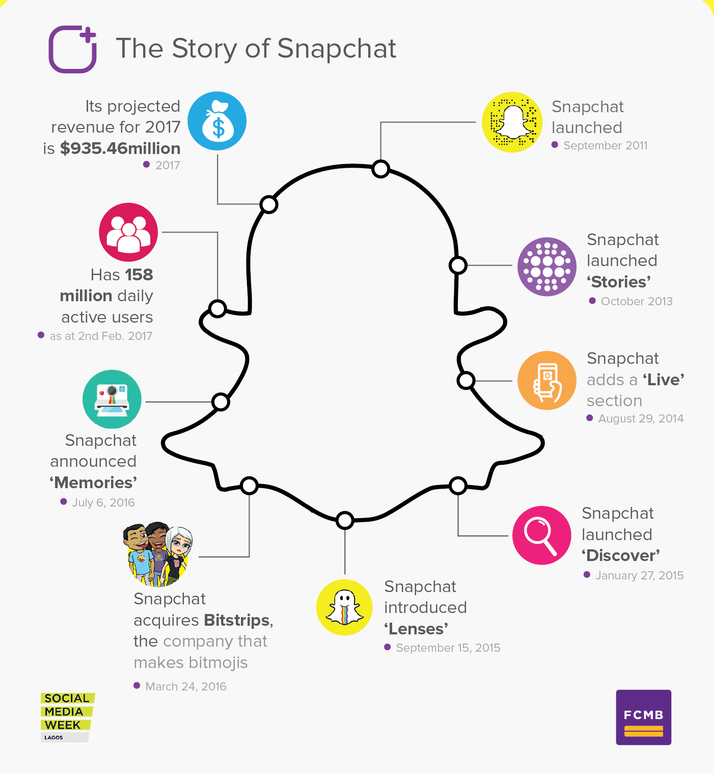 We’ve come a long way from what was previously science fiction to what is becoming an expectation for Generation Z.
What’s in it for Snapchat? By changing tact they may find an innovative way to seek out the soon-to-be-connected of the next decade, or the less-than-ideally connected of today. Especially since nearly nine of ten phones in the world are Android. That’s as fair a starting place as any. It does bear reading that “Snapchat has said its business will benefit from a base of users concentrated in top markets for advertising spending.” Namely the US, where in 2018 Zenith Optimedia expects $201 billion in advertising spend. 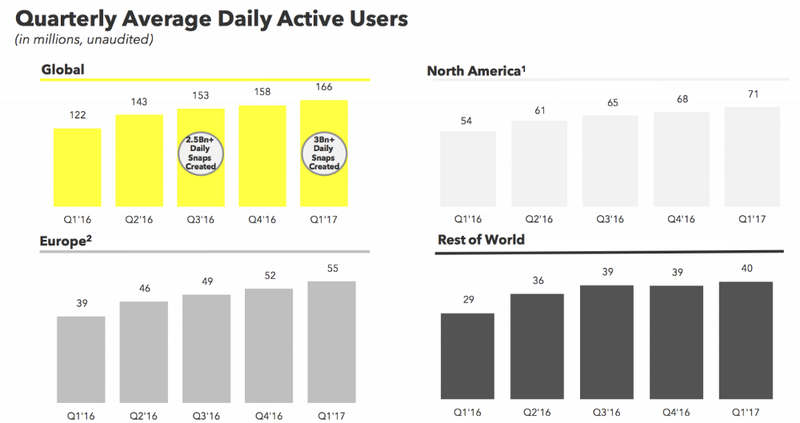 They generated an average of $2.15 from each user in North America according to Snap’s IPO filings. Facebook, having a more monumental goal of connecting the world, is making efforts to address this. 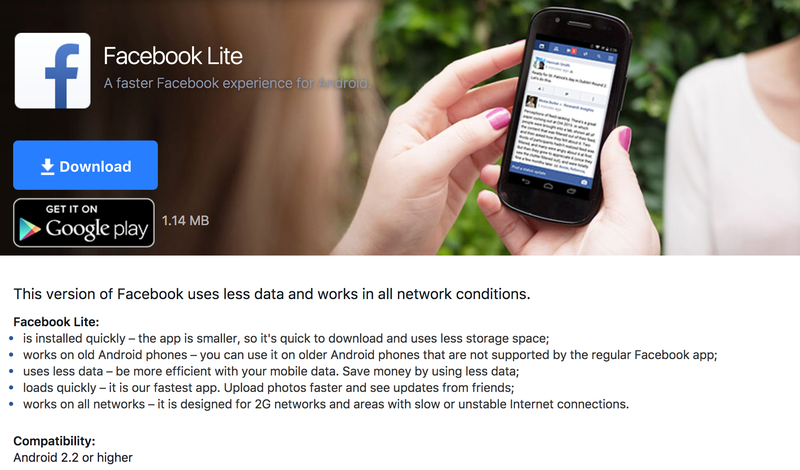 They launched Facebook Lite for 2G connectivity or unstable and fluctuating developing world phones that may not even see necessary Android updates. The significance of this was their focus on also making the size of the app as small as possible. 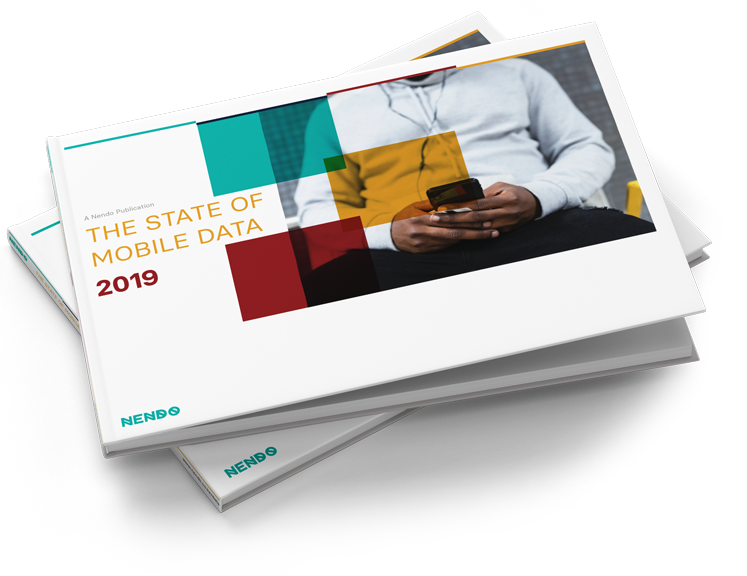 It cannibalised their main Facebook app, which as per our review, sat at 18 MB in size, far more than the daily data bundles of several target segments in our and other markets. To allow Facebook Lite to exist is to fight at the market share that Opera Mini has. For those Facebook users who choose Opera Mini as a mobile browser, they deny Facebook the opportunity to study their habits, get access to their address books and phone information, even when unconnected. Facebook was wise to consider sacrificing the size and sophistication of their app to gain market share and data access. Facebook’s internet.org initiative continues its ambitious goal of giving free Internet access through its app, both to Facebook and other apps in their marketplace. Facebook has also taken the extra step to roll out affordable 40MB Wi-Fi hotspot “bundles” costing Ksh. 10 ($0.01) in three Kenyan cities. Express Wi-Fi has also gone on to launch commercially in India with 20,000 more to come. If Facebook simultaneously solves the hurdle of data prices in a pre-paid world, they may lock in new users to FB’s own Internet. A battlefront Snapchat can’t afford not to play on. Snapchat have plenty on their plate: earning the trust and belief of shareholders and the market, competing with Facebook and hubris. It didn’t help when the CEO recently likened Facebook to Yahoo during their earnings call. If pundits are anything to go by CNBC’s Jim Cramer said Snap CEO Evan Spiegel “killed themselves” and needed to be ‘hazed.’ If Snap wants to grow in this part of the world, they should consider connectivity to their service in a pre-paid world a worthy opponent. In the developing world, Snapchat isn’t the enemy, Facebook isn’t the enemy. Data is the enemy. If you enjoyed this article, we’d love if you hit the green ❤ below and you should sign up to The Letter N, our newsletter.